12" x 12" x 3/8"
Walls for Your Walls Series: Each piece is a 12" x 12" full color laser print hand-mounted on 3/8" MDF (Masonite) board with a hand-painted black border. A sawtooth hanger is mounted 1/2" from the top. Each piece is signed by the artist. 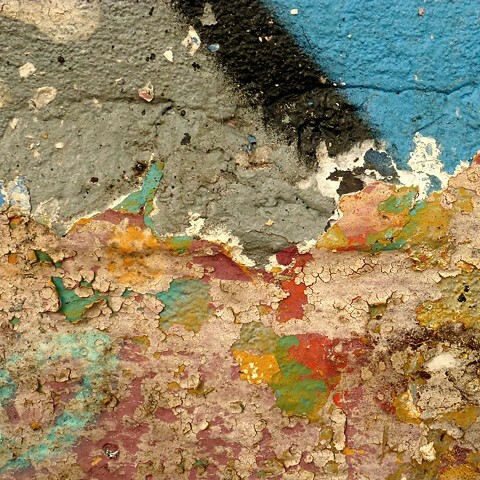 These pictures are original photography of walls around the globe, most shot upon discovery of a Ready-Made Work of Abstract Expressionism (RMWAE) just waiting to be captured! Admittedly, a few of the hundred-plus 12" x 12" mounted images are just walls. And some are not walls at all; they just appear to be at first glance. Can you find the pretenders? Backstory: When Jan and I travel around the world, she takes wonderful images that have consistent context clues that let you know exactly where we are, offering a glimpse into people's lives and the world they live in, and often a little story telling. They're really good. So, I take a lot of images, too, but we don't see the same thing. Most of mine could have been taken anywhere: sewer lids, road cones, textures, graffiti, architectural lines, geometric shapes, and...walls. So I decided to let the world (that's YOU) see some of what I see. I'm starting with walls. There are 104 different images. Find the pretenders!